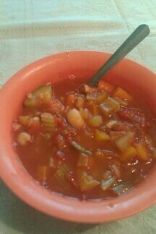 Fresh veggies and canned beans make this tasty high fiber soup. 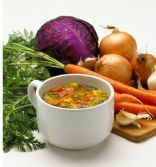 This healthy soup tastes like you slaved over a hot stove all day but comes together fast enough to eat any weeknight. Sweet potatoes, carrots and kale make this delicious. Using steel-cut oats as your grain of choice makes the soup thick and hearty, too! 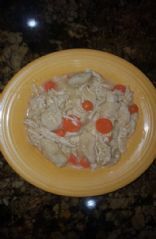 This is a delicious and easy soup that is a kid pleaser in my house. Even though the cream is optional, it adds that extra bit of flavour and texture and even with the cream it is low calorie. In an effort to always have vegetables on hand, I opted for frozen. Some frozen veggies just aren't as good as fresh so in the freezer this bag stayed until I decided that they needed to be eaten or thrown out. Who wants to throw out food in these economic times? I like to have a veggie soup on hand for lunches at work. I use whatever vegetables are hanging around in the fridge, or whatever half-bags of veggies are in the freezer. 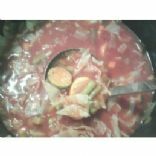 The veggies in the recipe are ones we always have on hand make it into the mix. I sometimes add a can of beans to get more protein. You can easily take the calories & fat down by substituting milk for the cream, or using less cream. 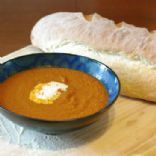 A fantastic soup to accompany a sandwich, main meal or as a snack. A filling soup that will warm anyone on a cold winter's day. Feel free to add additional vegetables.